Albertina (Mattson) Larson. Originally from Willmar, MN, she took up a farmstead with Hans T. Larson in northeastern Wells County, North Dakota. Approximately 20 years or more ago, I recall going to a Larson-Mattson family reunion somewhere in Minnesota. It was important to the Mattson side of the family because my dad’s, mother’s, mother (in Swedish, “min far-mor-mor“), Albertina (Mattson) Larson, was indeed a Mattson. I remember at that family reunion being asked who in the room had relations with the Swedish-Minnesota Civil War Col. Hans Mattson, and I was nudged by my late Grandma (Larson-Mattson) Barth to raise my hand. Now fast-forward to a year or two ago, when I read H. Arnold Barton, A Folk Divided: Homeland Swedes and Swedish Americans, 1840-1940 (Southern Illinois University Press, 1994). Barton notes in his preface that ethnic groups engage in a kind of ethnogenesis. This means the groups develop a collective identity by gathering together and agreeing upon what they do not stand for, and what they do stand for (often times, we define ourselves by what we are not). While reading Barton’s book, though, I didn’t expect to come across Hans Mattson in the beginning of chapter 5. This was the individual I was told about over two decades at the family reunion in Minnesota. Perhaps Barton was in the crowd too. Who knows. In his piece of academic scholarship, though, Barton said Hans Mattson hailed from the southern province of Skåne in Sverige, and he came to the U.S. in 1851 as one of the first northern European Swedish settlers to Minnesota. He served with distinction in the Civil War, and eventually became Minnesota’s Secretary of State. He returned to Sweden in 1868-69 to recruit more settlers and develop a chain-migration from Sweden to Minnesota. It worked. He acted as the Northern Pacific Railroad’s chief emigrant agent from 1871-1876, and the list goes on as to his accomplishments by and for his ethnicity. Albertina (Mattson) Larson, a Swedish-Minnesotan originally from Willmar, MN. 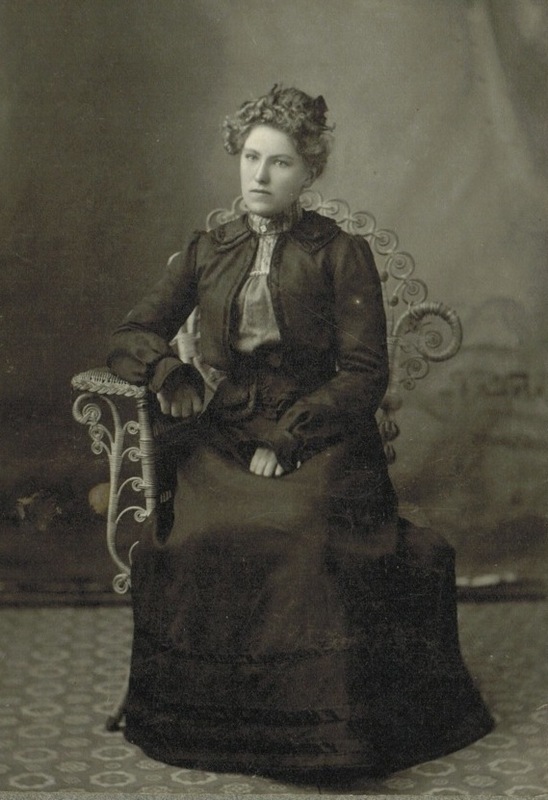 With all that said, here are a couple photos of Albertina (Mattson) Larson, my great grandmother. I never had a chance to meet her in person, as she passed away before I was born. As a girl, she grew up in Willmar, Minnesota. Eventually my great grandfather, Hans T. Larson, got up the nerve to ask her to marry him, and they took up a homestead in northeastern Wells County, North Dakota (just north of the borderline historic archaeological town of Bremen, ND). I’m sharing photos of Albertina for a couple reasons. The first is to make them accessible to other family members (it’s the worst when people hoard documents and artifacts while simultaneously doing nothing with them). There are unknown benefits, too, as perhaps this blog post will reach other Mattson family members who are interested in the various branches of the family. I do plan on ultimately curating the originals with the State Historical Society of North Dakota (but I’ll wait until the grand expansion is complete). By curating them with the SHSND (or any top-tier public archive), the artifacts will be stored in a safe spot with all sorts of fire-prevention and non-acidic devices (stuff along those lines). They will also be accessible to other family members, at least during SHSND archival hours. And if Swedish-American scholars want to have a look, to analyze and scrutinize them, they will be there. Perhaps they will even incorporate them into some piece of future scholarship. Who knows. Access is key, though. This entry was posted on Tuesday, October 8th, 2013 at 9:47 am	and tagged with Albertina (Mattson) Larson, David L. Barth, Genealogy, Larson Family, Mattson Family, Minnesota, National Archives, North Dakota, Sweden, Vivian Barth and posted in Uncategorized. You can follow any responses to this entry through the RSS 2.0 feed.